Utilizing the SolidState 2 and SolidState 6 reagents, underground construction contractors can easily and quickly solidify and stabilize drilling fluids to cut time, costs and the environmental impact of disposing waste. These reagents can convert liquid spoils into a solid in the time it takes to get to a dump site, or less, and create dry, stackable solids for easy handling and transportation. “We’re excited to partner with the Ditch Witch organization to expand our offering throughout their global dealership network and create convenience for our current HDD users with one stop for reagents, drills, recycling systems, service and support,” said Andrew McNabb, MetaFLO president and CEO. 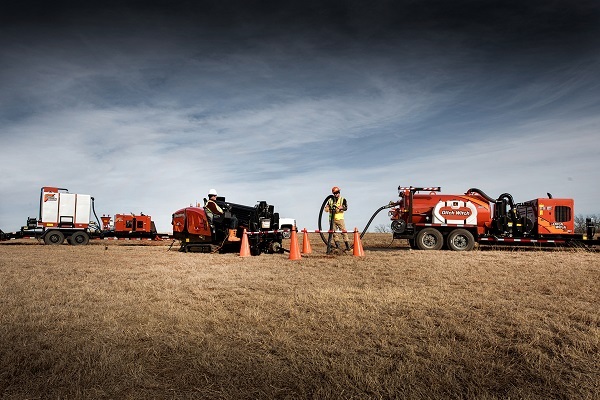 Both the SolidState reagents are exclusively sold through the global Ditch Witch dealer network, providing a one-stop shop to underground construction contractors for their jobsite needs. The SolidState 2 reagent is engineered to work in conjunction with mixing systems for large volume applications. It solidifies liquids in fewer than 30 minutes using a typical dosage of 0.5 – 1.5 percent by weight. The SolidState 6 reagent is specifically designed for heavier, semi-solid waste streams. It absorbs quickly and works immediately, solidifying liquids in fewer than 10 minutes using a typical dosage of 0.25 – 1 percent by weight. One specific customer was using a competitive product in attempt to dry liquid spoils before removal – using between 3,400 and 5,100 lbs of the product per a 20-yard bin of spoils to get it dry enough to transport to a dump site. This process was costing the customer between $420 and $610 on top of disposal weight costs. After switching to MetaFLO, the customer now uses only 250 lbs of the SolidState 6 reagent to solidify the same amount of spoils at a cost of $310, a $110 to $300 savings every time. Click here for more Ditch Witch news!